Offering 18 of the 30 big-game-hunting species, British Columbia (BC) is a province rich in wildlife, wilderness and outdoor adventures. From mountain tops to valley bottoms, river edges and lakes, to grasslands and forests, BC has it all. British Columbia hunting is regulated by the Ministry of Forests, Lands and Natural Resources and links to some important resources regarding hunting for non-residents can be found on our Hunting Info page. Click on the links below to find out more about the characteristics and hunting opportunities found within each region and then use the search by region to find all the guide outfitter members in that region. Vancouver Island’s stunning geography is the backdrop for a wide variety of wilderness adventures. The Island’s wildlife population may best be summed up as “bears, bears, and more bears.” The black bear concentration on the Island is second to none in the world, and guide outfitters regularly assist their hunters in finding Boone and Crockett trophy bears. Some guide outfitters also maintain sections of coastal mainland directly across from their primary Island territory, and here large coastal grizzly bears are in abundance. Outfitters here also offer mountain goat opportunities, and hunting the Coastal Mountains within eyesight of the Pacific Ocean is always a thrilling experience. Pristine timberlands, cascading waterfalls and snowcapped mountains welcome you to the region known as the North Thompson. The North Thompson region provides unlimited outdoor activity possibilities. These include heli-skiing and heli-hiking, cross-country skiing and snowmobiling, whitewater rafting, canoeing, camping and back-packing, to name just a few. Clearwater, the gateway to Wells Gray Provincial Park, draws visitors from around the world to appreciate the Park’s spectacular scenery and to experience its exceptional wilderness. Dominated by vast plateaus and rolling hills with sweeping timberlands and numerous fishing lakes, the Nicola region is known mainly for cattle ranching. British Columbia’s Southern Guides Association is composed of members operating in the notably abundant and productive Kootenay area. This region is renowned for its high concentration and variety of big game species. Game in this region is plentiful and includes elk, mountain goat, bighorn sheep, grizzly, black bear, mule deer, whitetail deer, Shiras moose, and cougar. 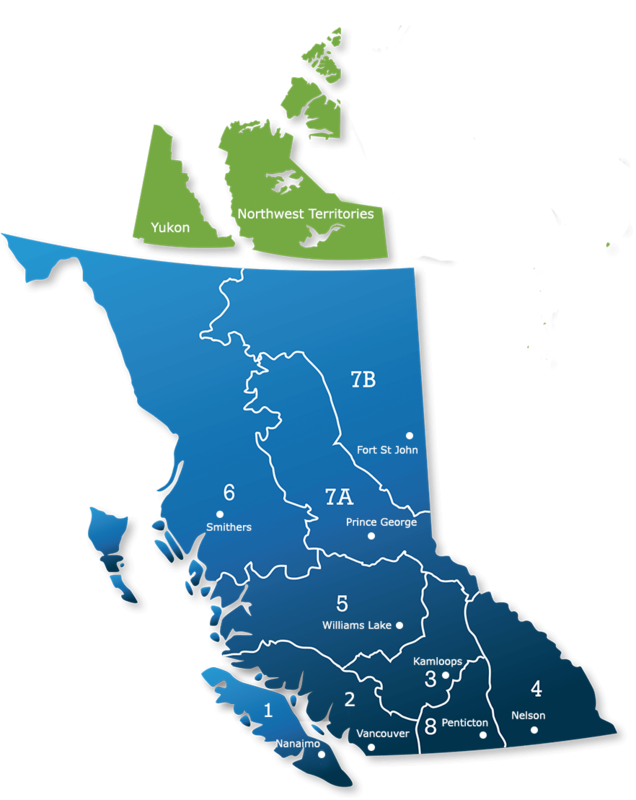 The Cariboo Chilcotin region is located approximately 150 air miles north of Vancouver and encompasses the municipalities of Williams Lake, Quesnel and 100 Mile House. Located within this region’s boundaries are three of British Columbia’s preeminent parks: Bowron Lake, Wells Gray and Tweedsmuir Park. The biogeoclimatic zones range from the heavily ridged, irregular Coast mountains, to the Chilcotin Plateau consisting of dry, pine-forested areas spotted with spruce swamps and wild meadow. This region encompasses the northwest quarter of the province and hosts a diversity of animals, fish, and birds. Black bear hunting is excellent in the region and Dall’s sheep can be found in the northwest corner, with fanin and Stone sheep found further east and south. Some of the best moose hunting in the province can also be found in the Northwest. All of the high mountains have resident mountain goat populations. Caribou are common in the north half of the region. There are major salmon watersheds as well, with some of the finest salmon and trout angling in the world. You can also fish for char and greylings. This is the heart of British Columbia’s moose country. Approximately 4,000 moose are harvested annually here in this outstanding moose habitat. Two-year-old bulls that produce 400 pounds of dressed meat and mature bulls with antler spreads measuring over 55 inches are becoming common. Black bear and grizzly are common in the mountainous areas, as are mountain goat, mountain caribou, Stone sheep, and in some instances, bighorn sheep and elk. Mule deer are on the increase in the area and many hunters pursue them in season. The Fraser Plateau is a comparatively flat, forested area with numerous lakes, small streams and marshlands, amounting to nearly half of the entire region. To the east, the terrain rises to the highest point in the Canadian Rockies, Mount Robson. To the north, the majestic Omineca Mountain range stands tall. Northern guides conduct business in British Columbia between the eastern slopes of the Rocky Mountains, south of Dawson Creek, north to the Yukon border and over the divide into the Rocky Mountain Trench. Within this vast area, sportspeople are able to pursue the majestic stone sheep in the mountainous terrain north of the Peace River, while Rocky Mountain bighorns are well established among the mountains of the Alberta/BC border. Moose, mule deer, wolf and black bear are harvested throughout most of the areas. Long known for the fabulous mule deer hunting it offers, the Okanagan region of British Columbia is presently making a name for its whitetail hunting. Those in the know are flocking to the Okanagan to try for the world-class whitetails roaming the mountains and backwoods. If it’s elk you want, the Okanagan region offers some of the best elk hunting in North America. With several decades under their belts, the outfitters in the region are more than able to meet the challenge of putting a hunter within shooting range of a good, respectable trophy. Yukon, formerly Yukon Territory, is located in northwestern Canada, an area of rugged mountains and high plateaus. It is bound by the Northwest Territories to the east, by British Columbia to the south, and by the U.S. state of Alaska to the west, and it extends northward above the Arctic Circle to the Beaufort Sea. The capital is Whitehorse. The mineral wealth of Yukon has been known since the famous Klondike gold rush of the later 1890s, but the combination of an Arctic climate and remoteness from markets has limited the economic exploitation of such resources and the development of modern settlement. Instead, the territory remains among the few frontiers on the North American continent, a sparsely populated and largely unspoiled wilderness. Area 186,272 square miles (482,443 square km). Pop. (2011) 33,897. The Northwest Territories is a territory of Canada with a population estimate of 43,537 and is the most populous territory in northern Canada. The Northwest Territories are bordered by Canada’s two other territories, Nunavut to the east and Yukon to the west, and by the provinces of British Columbia, Alberta, and Saskatchewan to the south. The Northwest Territories reaches over 1,300,000 km² (500,000 sq mi) so there is a large climate variant from south to north. The southern part of the territory (most of the mainland portion) has a subarctic climate while the islands and northern coast have a polar climate. While Nunavut is mostly Arctic tundra, the Northwest Territories has a slightly warmer climate and is mostly boreal forest (taiga), although portions of the territory lie north of the tree line, and its most northern regions form part of the Canadian Arctic Archipelago.